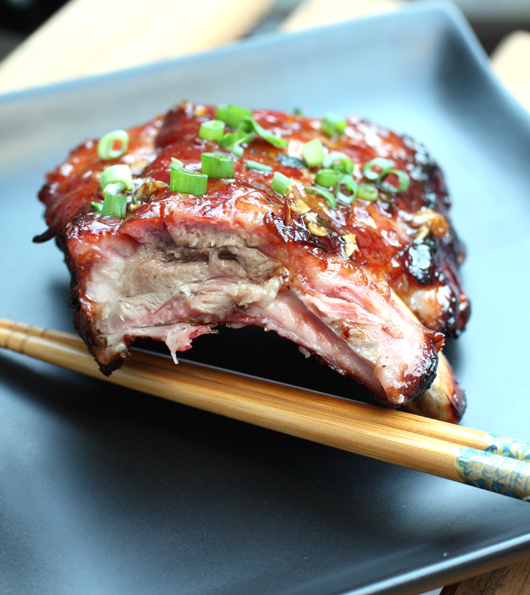 These are the ribs of my Chinese-American childhood — only way better. You’ll recognize them by their deep, shiny red color of candied apples. They’re the sweet, sticky ribs so often enjoyed on appetizer platters at Chinese restaurants. I remember them as the ribs my late-Dad would pick up by the pound at a Chinatown deli, wrapped still warm in a foil-lined bag, which he toted home to enjoy for our weeknight family dinners with plenty of fluffy steamed rice alongside. Barbecue-meister Steven Raichlen one-ups those with this recipe for “Chinatown Ribs” from scratch in his “Raichlen on Ribs, Ribs, Outrageous Ribs” (Workman). Their flavor, reminiscent of char siu or Chinese barbecued pork, is so much more vibrant than the ribs you can buy in Asian delis. There’s a far deeper complexity, what with the notes of ginger, garlic and star anise, plus the bite of fresh scallions strewn over the top. They’re also far juicier. The ribs need to marinate in a blend of hoisin, sugar, five-spice, soy sauce, rice wine, sesame oil, ginger, garlic and scallions for at least four hours or overnight, so plan accordingly. But believe you me, ribs this finger-licking good are worth waiting for. Place hoisin sauce, sugar and five-spice powder in a nonreactive mixing bowl and whisk to mix. Add soy sauce, rice wine, and sesame oil and whisk until the sugar dissolves. Stir in garlic, ginger, and scallion whites. Set one third of the marinade aside to make a sauce. Place a rack of ribs meat side down on a work surface. Remove the thin, papery membrane from the back of the rack by inserting a slender implement, such as a butter knife or the tip of a meat thermometer, under it. The best place to start is on one of the middle bones. Using a dishcloth, paper towel, or pliers to gain a secure grip, peel off the membrane. Repeat with the remaining rack. Set up your grill for indirect grilling and preheat to medium (325-350 degrees): For a charcoal grill, light charcoal in chimney starter. dump or rake lit coals into two mounds on opposite sides of the grill. Place an aluminum foil drip pan in the center under the grate. You’ll be grilling the ribs on the grate that’s over the drip pan, away from the heat, making sure to cover the grill. For cooking times over an hour, you’ll have to replenish the coals by lighting fresh charcoal in the chimney starter. For a gas grill with two burners, set one burner to the medium temperature. You’ll place the ribs over the other, unlit burner and then cover the grill. On a three-burner gas grill, set the outside or front and rear burners to medium. You’ll cook the ribs over the center, unlit burner, with the grill covered. When ready to cook: Brush and oil grill grate. Drain ribs well and place them in the center of the grate bone side down over the drip pan and away from the heat. 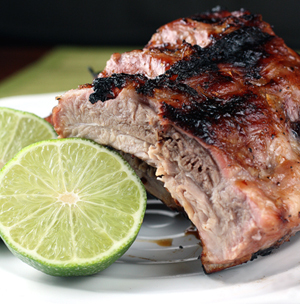 (If your grill has limited space, stand the racks of ribs upright in a rib rack.) 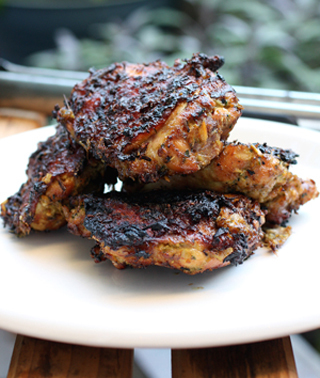 If cooking on a charcoal grill, toss half of the wood chips on each mound of coals. Cover grill and cook ribs until dark brown and very crisp on the outside and tender enough to pull apart with your fingers, 1 1/4 to 1 1/2 hours. When the ribs are done, the meat will have shrunk back from the ends of the bones by about 1/4 inch. If using a charcoal grill, replenish coals as needed. Meanwhile, transfer reserved marinade to a nonreactive saucepan, let come to a gentle simmer over medium heat, and cook until thick and flavorful, about 3 minutes. Let the resulting sauce cool to room temperature, then strain it into an attractive serving bowl. Transfer ribs to a large platter or cutting board. Let ribs rest for a few minutes, then cut racks in half or into individual ribs. 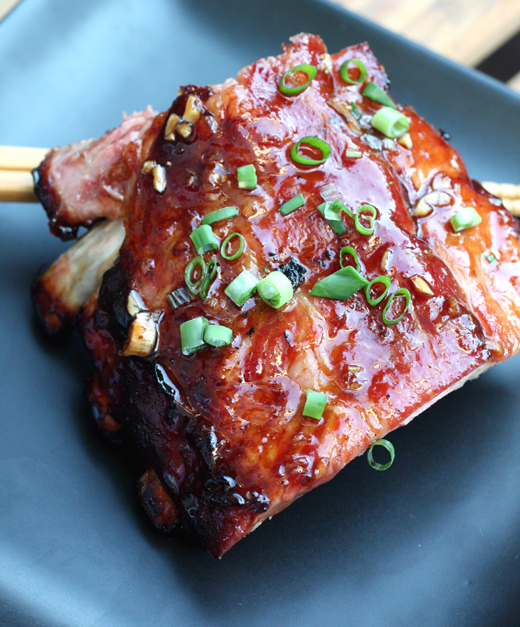 Brush or drizzle ribs with some of the sauce and sprinkle scallion greens on top. Serve at once with remaining sauce on the side. Variation: To cook ribs in a smoker, set up and light the smoker following manufacturer’s instructions and preheat to low (225-250 degrees). Place ribs in the smoker bone side down and smoke until cooked through 4 to 5 hours. You’ll need to replenish the wood chips or chunks after the first and second hour of smoking and to replenish the coals every hour.